Reproduction or use, without express written permission from Tandy Corporation, of any portion of this manual is prohibited. While reason­able efforts have been taken in the preparation of this manual to assure its accuracy, Tandy Corporation assumes no liability resulting from any errors or omissions in this manual, or from the use of the information contained herein. Set up and connect the Micro Color Computer, color video or TV, and CTR-80A cassette recorder following the instructions in the TRS-80® Micro Color Computer Operation Manual. Then follow the instructions below. Turn on the TV and set the volume at a normal listening level. Select channel 3 or 4 (whichever is weaker or not used in your area). On the MC-10, select the game channel by positioning the CHANNEL SELECT switch (on the bottom of the computer) to the appropriate setting. Set the antenna switchbox to the computer position. Turn on the computer. The POWER ON/OFF switch is on the right side of the computer. where v.r is a pair of numbers specifying which version and release you have. 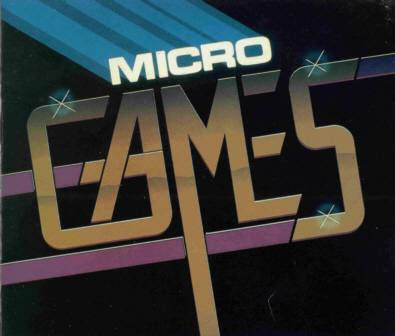 Place the Micro Games program tape in the cassette recorder. Set the volume of the recorder between 5 and 7. Rewind the tape completely, reset the counter to 0, and then position the tape a bit before the program you wish to run. Type CLOAD ”PROGRAM NAME” [ENTER]. “PROGRAM NAME” is the name of the game program you wish to play. Press the PLAY button on the recorder until it locks. The letter S appears in the upper-left corner of the TV screen while the computer searches for, and loads, the program. When the computer has found the program, the letter F and the filename appear at the top of the screen. If you want to stop any of the games while they are running, hold down the [SHIFT] key and without releasing it press [@], then release both. To resume play press any key. Pong is a game for two players. The first player to score 15 points wins. The game begins as soon as you finish step nine of the loading instructions. Player One uses the [W] and [Z] keys to move his paddle up and down respectively. Similarly, Player Two uses the [P] and [/] keys to move his paddle. When a player scores 15 points, the computer declares, GAME OVER! To begin a new game, press [BREAK] to exit back to BASIC. Then hold down the [CONTROL] key and without releasing it press . Then release both and press [ENTER]. The game reappears on the screen and the action begins again. Breakout pits you against the computer. The object of the game is to earn points by knocking bricks out of the walls until there are none left or you run out of balls. You get five balls in each game. Move the paddle up and down to hit the ball by using the [W] and keys. The computer keeps your score at the bottom of the screen and indicates the number of the ball you are currently playing. When the game is over, the computer prompts you PLAY AGAIN?. If you respond the screen reappears ready to begin a new game. If you respond [N] the screen displays BYE, COME BACK SOON! A crazy bird is flying around and it just won't stop laying eggs. Your task is to catch the eggs that the bird is dropping to the ground. Use the [A] and [S] keys to move the egg catcher left and right respectively. Press the space bar to shoot at the pesky bird. You score 25 points for catching the eggs and 50 points for shooting the bird (which reappears and begins dropping more eggs). You lose 15 points for the first egg to hit the ground at a given spot and 5 points for each egg that hits that same spot. The game is over when the bird succeeds in covering the ground with eggs. Take this game seriously; it's no yolk. To begin a new game, press [BREAK] to exit back to BASIC. Then hold down the [CONTROL] key and without releasing it press . Then release both and press [ENT ER]. The game reappears on the screen and the action begins again. Circumstances have forced you to take the helm of the Lunar Lander. Your mission is to safely land the spacecraft on the surface of Luna. To land saf ely on Luna you must achieve zero altitude at zero velocity, a very difficult task. If you fail, you crash your vehicle. But don't worry, you and the other passengers aboard are protected by an energy field that will protect you from serious injury. You man the shipboard computer terminal to monitor the landing. Luna's 4	gravitational force is pulling you faster and faster toward the planet. Use the number keys to fire your rocket to apply thrust against the pull of the planets gravitational force. The higher number keys release more thrust; the lower number keys release less thrust. But beware of your velocity. If your velocity exceeds 500, the Lunar Lander will burn up in the atmosphere. Also beware of too much thrust. If you thrust to the point of gaining altitude you may get an error message and lose control of the ship. Begin again. One further caution, beware of the available fuel. Although there should be ample fuel for the landing, keep an eye on fuel consumption and practice efficiency so you won't inadvertently run out. To play again, press [BREAK] to exit back to BASIC. Then hold down the [CONTROL] key and without releasing it press . Then release both and press [ENTER]. The landing sequence begins again. The call to the post plays over the loudspeaker system. The sleek, handsome race horses are in the chute. And they are off and running: it's Cabbage, he's ahead, and there is Rubberband coming 'round the stretch. Who is going to win? No one knows until the horses reach the wire. That is the fun and excitement of a day at the races. You and your friends choose any of the five horses as they line up at the gate. After all choices have been made, press any key to start them off. Every horse has an equal chance of winning. You never know who Is going to win. After the winner of the race is declared, press any key to get the horses at the gate for the next race. Press any key to begin the next race. Press [BREAK] to exit back to BASIC.